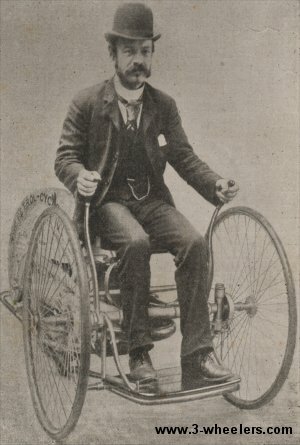 Butler however did not patent (Patent 15598 - London) his vehicle until 1887 due to British laws on experiments. On the vehicle the patent read “Butlers Petrol-Cycle Syndicate Limited Patent”. It also referred to “F.B. Shuttleworth, Erith, London.” as Butler built the Petrol Cycle in the works of F.B. Shuttleworth. In 1890 Butler finished his design which was a vehicle powered by an engine that used mineral hydro-carbons. The two-cylinder engine worked by a spray of Benzoline or petroleum product carburetted with air. The configuration saw two 32 inch wheels at the front which steered the vehicle. This was done by a pair of rocking handles actuating the front wheels which moved on separate pivots. 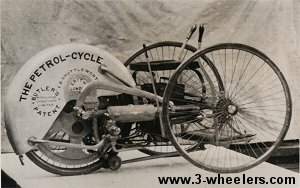 A single rear wheel was powered by a chain whilst a single saddle type seat was positioned in between the front two wheels. 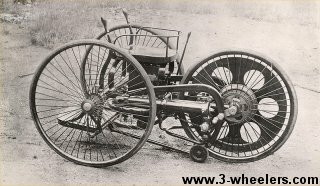 A braking device was attached to both front wheels and activated by a foot lever. “..the authorities do not countenance its use on the roads, and I have abandoned in consequence any further development of it. At the time the maximum speed was 2 mph in the city and 4 mph in the country side. In addition each vehicle had to be attended by 3 people of which one had to walk in front of the vehicle waving a red flag (The 1865 Red Flag Act) to warn other road users and help control horses. This act had originally appeared as a result of the growing number of steam powered vehicles. You can see how restrictive this speed limit was for Butler from an article on the Butler Petrol Cycle in the February 14th 1891 edition of the Scientific American. This stated that one gallon of petroleum or benzolene was enough to “furnish sufficient power” to achieve a journey of forty miles at a speed ranging from 3 - 10 mph. The speed of the vehicle was regulated by a throttle valve lever whilst over heating was prevented by water circulating through a radiator over the rear driving wheel. Stopping and starting the vehicle was managed by raising and lowering the driving wheel from the ground by a foot lever, the weight of the vehicle was then spread onto two small castor wheels ahead of the driving wheel. “Now that public attention is being drawn to the early attempts of the two German pioneers, Benz and Daimler, I trust that you may find space in your journal for an illustration (Second image on this page) of a small petrol vehicle, which I believe was absolutely the first made in this country, and if I could have interested any one to finance it when the drawings were exhibited at the Stanley Show in 1884, and the following year at the Inventions Exhibition, I should have been contemporaneous, if not earlier than either of them. My thanks go to Jane Neil for all of these photographs along with plans, letters and magazine articles that provided most of the information for this page. 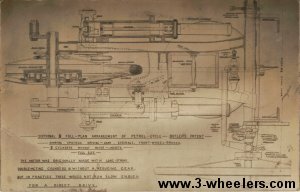 One of the Blue Prints for the Butler Petrol Cycle. 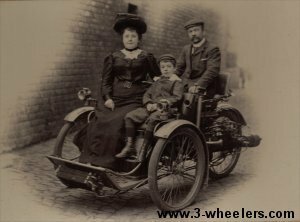 The Butler Family (Edward Butler with his wife Kitty (Kate Gildersleeves - thought to be the World’s first lady motorcyclist) and his son Eric) aboard another 3-wheeler in the early 1900’s. e-interview with Jane Neil - Edward Butler’s great niece.